If you should find yourself wandering through some of Pittsburgh’s parks, you may notice trees with bands of white tape that read, “Ash Tree Conservation Project.” The tape marks the city’s last remaining ash trees, hardy survivors that recently underwent treatment to protect them from the destructive emerald ash borer (EAB). First spotted in southwestern Pennsylvania woods in summer 2007, EAB has proven to be a formidable ecological threat. For four months of the year, the beetle deposits its tiny eggs along the trunk and lower branches of ash trees, as well as inside cracks and crevices. Hatched EAB larvae then tunnel into the host tree, making S-shaped galleries that ultimately destroy the tissues needed to move water and nutrients through the tree, eventually starving it. To date, this invasive insect has killed approximately 68,000 ash trees in Pittsburgh’s park system — nearly 16 percent of the entire tree canopy. It’s no accident that this small population of ash trees in Pittsburgh survived the destruction of EAB. Since 2011, through routine, three-year inoculations, the Pittsburgh Parks Conservancy and the city of Pittsburgh have protected this select population of about 130 ash trees. They were chosen for their health and age, and the seeds these survivor specimen trees produce are key to repopulating this native species in our region. In the future, these seeds will be collected for research in the hopes of creating EAB-resistant ash trees. Ultimately, we hope to protect these trees until it’s possible for this unique species to become resilient enough to once again take root in our region’s woods. 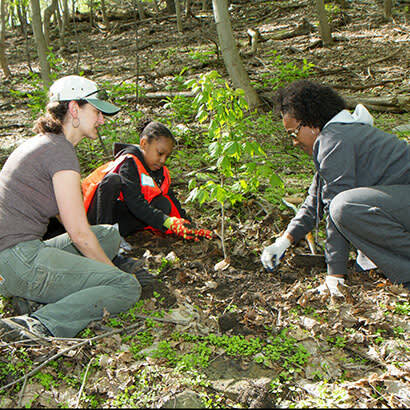 Biodiversity is critical to healthy parks and forests. In our changing climate, voracious pests and sneaky diseases that gain a slight foothold within parklands can spread like wildfire before they can be noticed, caught and quarantined. It’s possible for common species, like those ash trees, to be all but eliminated in a decade or less. Whether plant, animal, virus or bacteria, all living organisms are locked in a battle with the pathogens, pests and parasites in their surrounding environment. Using the tools and tricks that nature has equipped them with keeps them in the game. One of the oldest, strongest tools in this arsenal is the ability to adapt, then pass along that element of survivability to the next generation. The founders of Pittsburgh’s parks left quite the legacy, not only in the consideration that they gave to the design and preservation of parkland, but also the impressive diversity of the urban forests. While it may be impossible to stop pests and diseases from invading, the Pittsburgh Parks Conservancy aims to give park trees a fighting chance by carrying on this important effort to increase biodiversity. Surrounding the popular community space of Schenley Plaza, near the Carnegie Museum of Natural History, is a stand of large, regal London plane trees. These massive trees don’t just offer shade on sunny summer days; they ring an alarm on a national level. However, a study conducted by Gruszka and Dr. Cynthia Morton, formerly of the Carnegie Museum of Natural History, found something surprising about the Schenley Plaza trees: They are all genetically different. The trees, planted before Bloodgood started to gain popularity, are much more diverse than the current nursery stock. Of nearly 200 such trees that have been planted over the years in Pittsburgh’s parks, 100 are of a strong, diverse population, toughened from years of fighting off pests and disease. Were these study findings true only for London planes? Gruszka and Morton widened their net to test Pittsburgh’s park tree diversity against trees sold around the country. After polling nurseries from various parts of the country, they found that 10 common trees used all over the United States were clones — tree stock from major nurseries across the country is diminishing the tree gene pool. Because a large majority of trees sold in nurseries are clones (i.e., genetically identical), a threat to the health of one of these trees could threaten them all. Thriving, mature trees are a sign of a strong genetic makeup that is well-suited to the region where they’re growing. These trees are part of Pittsburgh’s plan to grow a stronger urban forest. Pittsburgh Parks Conservancy horticulturalists currently are gathering seeds from a pool of parent trees that exhibit signs of resilience to conditions around the city. After collection, these seeds are taken to the Tree Pittsburgh Heritage Nursery where they are scarified, germinated and grown to a two-gallon container size. Once big enough, they will be transplanted into a new tree research grove in one of our large regional parks, where our horticulturalists will care for the trees and carefully monitor them for disease and deformity. This new research grove will provide a space to plant native seeds from trees in our parks and identify those that thrive. It will likely take seven to 10 years for the trees to fully mature within the grove. Trees that are unsuccessful will be removed and transplanted as restoration trees in park woodlands, while those that present as ideal candidates for landscape plantings will be made available to the public at nurseries for future plantings in our region. Through this effort, a new, diverse pool of trees will be introduced to our city. Once we ensure that these trees are fit to survive Pittsburgh’s climate conditions, they will be available to all. Trees, like human beings, are genetically diverse. Faced with threats, they fight and adapt, passing along their strongest traits to the next generation. Greater genetic diversity is one of the strongest defenses our urban forest can hope for ,as an increasing number of diseases and non-native insects threaten at least 60 percent of our tree canopy. Upon learning so many trees from major nurseries were cloned and sold nationally, Gruszka and Morton presented their findings in the United States and abroad. They discovered that this sort of cloning practice is also followed in parks and nurseries worldwide. As climate change shifts the norm in the cities, we rely more and more on the air-cleansing, city-cooling, carbon-sequestering, stormwater-soaking benefits provided by our local trees. For our future woodlands, and our future cities, we would do well to nurture an urban forest with the ability to change, adapt and be resilient. Lauryn Stalter is the Engagement Coordinator for the Pittsburgh Parks Conservancy (@pittsburghparks).